Finished piece from this sketch. Assault Android Cactus is a game Mim and I have been enamoured with since we first discovered it nearly 3 years ago. I've written about the game once or twice, and Mim and I have been inspired to do some fan art previously as well. In the game, there is an enemy called a Fido (which has dog-like animations) that looks a little like a toaster. 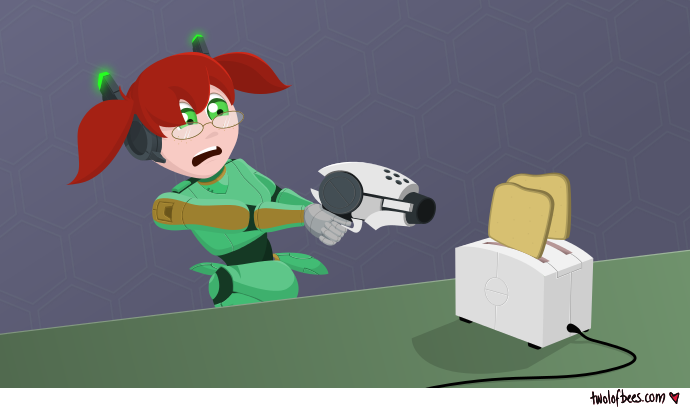 The idea of Holly (the jumpiest of Cactus' characters) being startled by a real toaster has hung around with me since I first played.